This pattern is quite simple concerning stitch counts etc. but it is a challenge for even the most accomplished tatters, since it does not only use Cluny leafs, but also Hanging Cluny (HC) leafs. The Hanging Clunies are a new technique by Tim Tenclay. Follow the link to get to the page where he shows how the technique works. I added a bit to the basic technique, but I will talk about that in the pattern. The technique is not that difficult, only brand new. If you can do Clunies, you can do HC as well. I developed this pattern back in 1996, when I first tried cluny leafs. It was very hard for me to do this, and the place of the HCs was then occupied by normal rings. You can still use normal rings instead of the HCs if you want to (these would be 8+8). Back then I decided that I'd wait redoing my first prototype until the time my tatting skills grew. I had cramps in my hand after doing that many Clunies in a row! In 2002 I visited a class taught by Adelheid Dangela and Renate Greiß, and I reviewed the Cluny technique back then. This year (2003) when I visited the same class I showed the HCs to the teachers. The class and teaching the HC made me take out that pattern again. When I redid it I saw that the HCs now fit in very well to replace the rings that I made to shape the long arm of the cross. As you see there is still some room for improvement in my Clunies; they need to get a bit more uniform <g>. For a cross of 12 cm height you need: one shuttle, thread no. 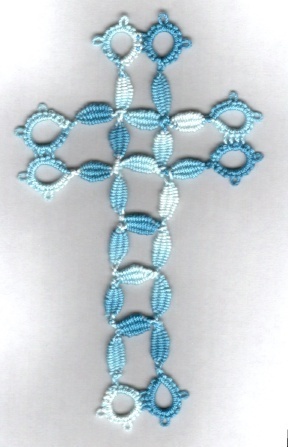 10 (the cross on the photo is made from Flora No. 10, Col. # 55 - variegated blue). Wind shuttle with 90 cm of thread. Don't cut, don't unwind any thread from shuttle to start. Start at Ring A (5-5-4-2-4), then do 3 Cluny leafs of 12 weavings (petals B,C and D; all Clunies have the same stitch count). See Fig 2 for working order of elements. Now go on with Ring E (4+2+4-5-5) joining to the last two picots of Ring A, c&t, hide ends. 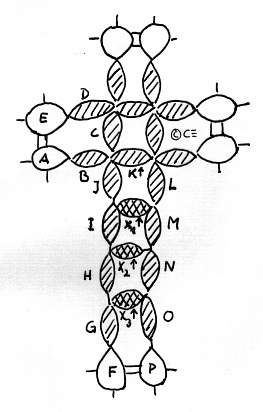 Now do two more of these little motifs and join them after the first Cluny so that you get the cross form (see fig 3). Wind your shuttle with 3.10 m of thread. For the long arm of the cross you start with ring F (same stitch count as ring A), work 4 Cluny leafs with two stitches between the leafs (no picot!) instead of just one in between. These are Clunies G, H, I, J. Now join to the part you already worked, make another Cluny (=K), join again. Now make the next Cluny (L), ending with a dk. Now make the first HC (X1). The tip of this HC is joined to the chain between cluny I and J. How this is done is explained below. I also made the leafs a bit different from Tim, which is also explained below. Make a dk, make the next normal Cluny leaf (M), then a dk, then the next HC (X2), a dk etc. until you reach the normal Cluny leaf O, followed by Ring P (same as Ring E). 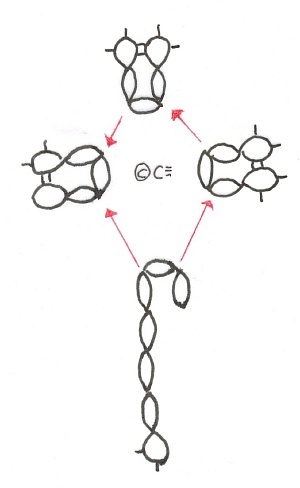 How to join the HC: Before you pull up the loops of the HC pull one loop over the ring and the Clunies that form one half of the long arm up till the point where Cluny I and J are joined. Now pull up the loop like the instructions say seeing to it that the loop is around the chain between Cluny I and J. I prefer to use the loop connecting to the ball thread to join. I did make the hanging Cluny a bit different from Tim, because I used the two middle threads as one warp thread in weaving, getting only two grooves instead of three. That way the hanging petals don't look much different from the other ones which is of course intended in this pattern. Another tip for the HCs is using a blunt needle for weaving instead of just the thread end. Designed November 1996, improved June 2003.